The DS18B20 is a 0.5°C accurate thermometer (This is the same accuracy as the LM35 device). It is extremely useful if you want to measure temperature within a large area, such as a building, since many devices can be attached to a single wire pair. Here you can find out more about the Dallas DS18B20 temperature sensor and how to use it on an Arduino Uno R3. You can actually use it with any microcontroller that allows bi-directional I/O pin i.e. virtually any modern microcontroller - then all you need is a bit of code. Note: The DS18B20 can take its power entirely from a data line pin requiring no positive supply other than that pin - this means you can place it in locations that do not have an easily accessible power source. You do need to add a ~5k pullup as the devices are open drain and the idle state is bus high. Each 1-wire device, including the DS18B20, has a unique laser engraved identifier so you can individually communicate with 1-wire devices. This is how each sensor is distinguished from another on the same bus. This is both good and bad; good because you can attach multiple devices and bad (but not too bad) because you have to identify and locate each device e.g in a large building installation you have to get the ID and log it in some software that shows where it is. The 1-wire interface is actually signal and ground so it should really be called a '2-wire' interface; It is called 1-wire because it is taken for granted that there is always a ground return path. This temperature sensor is a digital sensor with a basic accuracy of 0.5°C (and it only outputs data in °C) - it also has an adjustable resolution from 0.5°C (9bits) to 0.0625°C (12 bits) - the acquisition speed is affected by the chosen resolution - from 93ms (9bit res.) up to 750ms - nearly 1s - for max. res. of 12bits. Note: You can attach multiple 1-wire devices to a single microcontroller I/O pin. TIP: Make sure and read this warning on using a pull-up resistor (it won't work without one!) lower in this page (Click here to jump down the page). One of the key points about the device is that it does not always have to be fully active because it performs a temperature conversion at higher power and then stores the value in its own internal NV memory. This important if you use the two wire mode GND and signal - where the signal wire also powers the device. Note that resolution is not the same as accuracy - Any increase in resolution does not increase the accuracy at all rather it just allows you to monitor relative changes more easily. Note: Resolution is calculated from the data representation in Table 1 in the datasheet below where hex code 0 is 0°C and hex code 8 is 0.5°C therefore 1 bit represents 0.5/8 °C or 0.0625°C (at 12 bit resolution). Remember that the lower bits of the device output hex data must be ignored when using lower resolutions because the values of these bits are undefined so make sure they are zero when you use the output data. Do not wire this backwards - it will blow up - make sure you use the correct DS18B20 pinout to wire it up! Note: Some datasheets use the label "ds18b20-par" - the par text just stands for parasitic powered. Parasitic power (from the data line of the microcontroller). Warning : I thought I could get away with just powering the DS18B20 using GND and VDD, and using only a signal wire : Nope - you must have a pullup resistor from the chip control pin to Vcc of about 4k7 As Well (I used 3k3 at a pinch). If you don't, the Arduino library (1st example below) can not see the device. The device must be pulled-up with a resistor when the signal wire is tristate (even with GND and VCC supplied). If you do not do this you'll just see the message "No more addresses.". This be due to the signal method used (open collector) - so don't forget (as I did) that the pull-up is not just supplying power. Only a single pull-up will be needed and it can be placed close to the microcontroller pin. The first method "external power" is the easier route for ensuring correct operation but requires a local source of power. Since these devices can operate over very long cable distances i.e. within a building it is not always convenient to connect to a power supply where you want to measure the temperature. You can either use an extra wire to carry power or use the Parasitic Power Supply method but there are complications. Parasitic power is power derived from the single 4k7 pull-up resistor on the One-Wire bus. 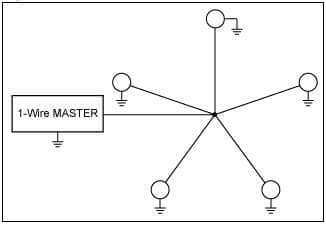 Parasitic power charges an internal capacitor in the 1-wire devices so there is still some energy there when the bus is pulled low by another device. The key issue with this is that during an internal EEPROM write (to the DS18B20) or while updating the temperature reading, up to 1.5mA can be drawn. Using the pull-up resistor alone to supply power, can cause the voltage supplied to the DS18B20 to drop possibly causing a reset. One solution is to use a stronger pull-up resistor e.g. 1kΩ. The datasheet indicates that a strong current driver (a MOSFET from Vcc to the 1-wire bus) should be used to supply power while these actions are executing i.e. to override the 4k7 pull-up - allowing more current to the sensor. The problem is that during the strong pullup action no other communication can be made over the onewire bus. A write to the NV (twr in the datasheet) EEPROM can take a maximum of 10ms (for the copy scratchpad command) - for a convert command the pull-up is held for the conversion time (93ms ~ 750ms)- that is how long the strong pull-up must be held to ensure valid operation! For continuous comms. i.e. communication with other devices use a power individually supplied to vcc of the DS18B20. This may mean using a 3 core wire instead of 2 wire or using a separate power supply at the DS18B20 device location. In the 'DallasTemperature' library provision is made to hold the microcontroller pin high for a time to perform a similar action to the MOSFET - most microcontroller pins have fairly high output current capability ~20mA. Using this method will still stop comms. though. Note: You can mix parasitic and external power devices on the same 1-wire bus. There is a mechanism to query the device on how it is powered i.e. to avoid having to use strong pull-up for an external powered device (see the datasheet). The recommended wire is CAT5 and you arrange them as a bus (daisy chained) not as a star network - this helps to avoid transmission line reflection problems. Originally the 1 wire protocol was intended for PCB communication only but its use grew into networked topologies with 100's of metres of cable. In fact using special driver considerations, 500m is achievable. The following figures are extracts from the that application note. There are many different ways to connect up multiple devices which include the following layouts: Series, stubs, Star and switched. There is also a lot more information on 1-wire interfaces in general here (See the "1 -wire" devices entry). You can program into the DS18B20 upper and lower temperatures (into non-volatile memory - internal EEPROM within the DS18B20 itself) so that if the temperature goes outside the upper or lower limits an alarm condition is created. This means you don't have to continuously poll each (of possibly hundreds of devces) to check for an out of range temperature condition. The master controller can issue an alarm search command at regular intervals- any DS18B20 connected to the 1-wire bus that has an alarm condition will respond. The controller can then find out which device has the alarm condition flag set. Note: Functions are defined for setting alarms in the "MAX31850 Dallas Temperature" library. See note at the end on the MAX31850. Both parasitic and external power connections can be used on the same One-wire bus. Note: Two DS18B20 devices are shown in the following circuits, but the code will work just fine with one - since it auto detects devices attached to the one wire bus. The left hand device is parasitic powered (the so-called 1-wire interface which is actually a 2 - wire interface - GND and signal) while the right hand device is externally powered (3 - wire interface - GND, signal and power). You can remove either device from the solderless breadboard and you'll still get a temperature reading from the other one! Device Used : DS18B20 (either on a breakout board or stand-alone). The first library is a user contributed i.e not included with the Arduino IDE but you can still install it using the Arduino IDE library manager. In the Filter Search type onewire. Click on the OneWire Library. Note: If you don't see the above library structure then you have got the wrong IDE (the correct one is from arduino.cc). Note: Clicking any text in the box below will copy it to the clipboard. Warning: Again as with the DHT22 code the above code uses hard coded delays - they are also the maximum delays, so even for 9bits the code uses a 1s delay! Of course you can change that but you have to be aware of it. See the Dallas Temperature library: Asynchronous mode for a different solution. Output from above code (oneWire Library). Temperature in and °C and °F ( °F is calculated using a floating point calculation). You can get the same results with this library but this one has more functions for better control over devices on the one-wire bus. Note: The MAX31850 DallasTemp library also supports the DS18B20. This library builds on the OneWire Library (references to the OneWire library are accessed through the variable '_wire' in DallasTemperature.cpp). It gives you a more complete access mechanism to control devices on the bus. In addition it tailors the delays required before update to the resolution in use (delays change with resolution). There is also an asynchronous mechanism to avoid wasting processor time while the sensor updates. In the Filter Search type dallas. Click on the MAX31850 DallasTemp Library (this also supports DS18B20). Open the Simple example above. The following sketch uses the OneWire and DallasTemperature libraries (Maxim bought Dallas - hence the old name). The first sketch is labelled "Simple"; Edit the pin 2 changing it to pin 4. Then use saveas to Simple_DallasTemp in your Arduino Library folder (default location). In the sketch below I added 2 more outputs as I have 3 DS18B20 devices on the bus - you can add as many output statements as device you have. oneWire reference to Dallas Temperature. Basically, if the flag is true and you initiate a temperature update for a device, then the code will return immediately - it is up to you to wait for the required time. You could make an interrupt timer to trigger fetching of the temperature while your code does something else e.g. updates a display, reads a keyboard or reads another device such as a humidity sensor. Note: The asynchronous delay mechanism allows you to avoid wasting processing time while a sensor updates BUT it is up to you to wait the appropriate length of time. So the routine either returns to your code immediately or performs a delay wait. The MAX31850 library is also capable of supporting the DS18B20 plus a few more temperature sensing 1-wire devices. 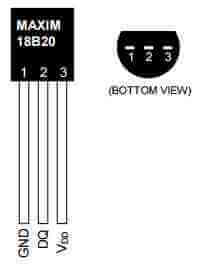 So you could mix this sensor with the DS18B20 on the same 1 -wire bus. This library is more capable than the 1wire library alone. The MAX31850 is a Cold-Junction Compensated Thermocouple sensor that is also a OneWire sensor meaning you can choose any of the available thermocouples (K, J, N, T, and E). As with the DSB1820 it has 12bit resolution. You buy a different MAX31850 (with different end code in the part number) that is matched to a specific thermocouple type (K, J, N, T, and E). Note: To use the MAX31850 they say (Adafruit) that you need to use the OneWire Library supplied by Adafruit - which is a a bit naughty since they are making branches in code instead of updating the original. I have not looked at it though - best to do as they say if you want a MAX31850 to work! Using a different thermocouple type increases the max min range or sensitivity e.g type K has a -200?C to 1350?C range. Jump from DS18B20 to the home page.